A man-eating tiger that killed three villagers in the past one week in a southern Indian state of Karnataka has been successfully caught after a rigorous search by the Indian forest department team. The tiger, prowling in Bandipur and Nagarahole forest range in the state, has now been tranquilized and caged as reported by the forest officials in a BBC report. Earlier, on Wednesday, the forest department had issued shoot-at-sight orders for the killer animal. The same day the villagers went berserk in fear and protested near the forest department guest house, damaging the property, and setting office jeeps on fire. On Tuesday, a 55 year old farmer, named Basappa, was mauled to death in a small village of Mysore district located on the outskirts of the Bandipur tiger sanctuary, making it the fourth tiger attack incident within a week. Reportedly, the deceased farmer had taken his cattle for grazing near the jungle area when the killer carnivore attacked him. 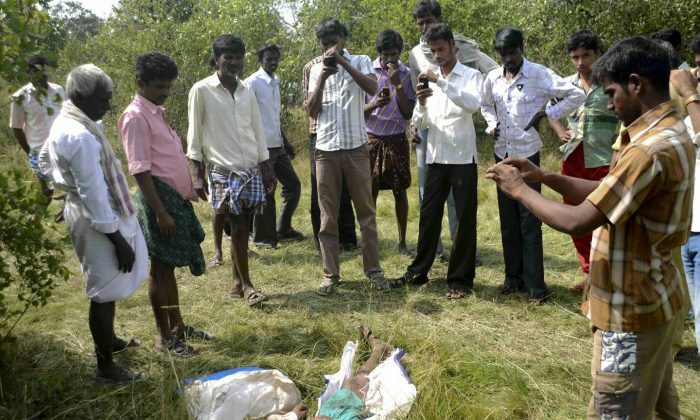 According to media reports, H.C. Kantharaju, the director of Bandipur Tiger Reserve, confirmed that the farmer was killed by the same tiger that had earlier mauled two tribals at Nadgur and Seegehaadi villages. On Saturday last week, one forest watcher, named Suresh, was also unfortunately attacked and killed by a tiger inside the Nagarhole national park; the watcher had went to answer a nature call during his night duty. The Bandipur-Nagarahole belt, a major tiger reserve area in India that supports around 140 to 180 tigers, is surrounded by 300 villages. The geographical layout often results in these deadly conflicts.